After a long and arduous dogfight of a custody battle, a canine victim of Hurricane Katrina is on his way back home to Louisiana. A New Jersey judge ruled, Thursday, that “Pluto” is the property of his original owner, Annabelle Arguello, and not the property of the couple, from Flemington, who later adopted the Great Dane after he had been left in Prairie, LA in early September. After Hurricane Katrina devastated her hometown, Arguello placed her dog, “Chopper,” in a temporary shelter to keep him safe. The shelter, soon overcrowded with animals, shipped pets to other animal shelters across the country, with the plans being that the animals would then be sent back on October 15th. 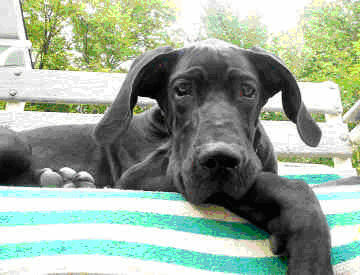 Unfortunately, this was not the case and the Behmke family were allowed to adopt the Great Dane from a shelter in Hillside, N.J.
George and Pam Behmke had become very attached to the dog, which they had named “Pluto,” and did not want to give him back to the original owner, hence the canine custody battle. In the end, however, the Behmke family expected that the court would order the dog returned to his original owner. Too upset to attend the court proceedings on Thursday, they left the dog with their lawyer, Christina Donahue, to walk into court. Hurricane Katrina made landfall on August 29th, 2005, causing widespread destruction between Louisiana and Mississippi. Despite incredible aid from other states and countries alike, many survivors are still trying to repair shattered lives. Many pet owners were forced to abandon their beloved animals under threat of police arrest; that even one pet can be reunited with his family helps to restore faith and hope to many a broken heart.